How To Display Facebook Page Videos On Website Using PHP? Need to embed a single Facebook page video on your website? Watch this tutorial. Need to embed a Facebook page live video on your website? Watch this tutorial. Do you have a video manager on your website? Do you upload videos on your Facebook page? If your answer is both YES, you’re wasting a lot of time managing your brand's videos online. What if there's a way to upload a video ONCE, and then let it appear both on your Website and Facebook page? Our code for today will make you happy then, just like we are! Today I'm gonna teach you how to display publicly available Facebook Page VIDEOS on your website. This one is great if you want your Facebook page videos to be shown in your website in a synchronized way. Once you uploaded a video on Facebook, it will be automatically reflected on your website too. 1.1 Gets videos listed with data such as the video itself, video title, description, date posted, etc. from your Facebook fan page without using any Facebook PHP SDK, just the Facebook Graph API! We used PHP classes and so features are easier to use, more actively improved and added. See the full list of features in section 10.1 to 10.3 below. It has all the details of these features. For now, let us learn how the BASIC source code was made. Enjoy the following step by step tutorial! Before you can get any data from your Facebook page via the graph API, you need a "page" access token. Follow this detailed tutorial about how to get a page access token: How to get a Facebook page access token? Replace YOUR_ACCESS_TOKEN with your page access token. Put a Bootstrap-enabled basic HTML after the code on section 4.0. $profile_photo_src so that the Facebook page primary picture will be rendered in thumbnail. $access_token obtained on section 3.0, this will give us the power to get Facebook page videos. $fields are actually column names in Facebook page videos database. $limit the number of videos you want to be displayed on your page. Use the variable values on the previous section and construct the $json_link. Get the data from that URL, decode it, and count the number of records it returned. Loop through each records, extract each video information and place it in an HTML structure. Put the following code after the closing 'html' tag. You can get the source code for free by following the whole, well detailed tutorial above. But isn’t it more convenient if you can just download the complete source code we used, and play around it? Need more reasons to download? If you think there's a missing feature, please let us know by sending me a message via email mike@codeofaninja.com, or via our official Facebook page! We can work on it! 10.3 Do You Want a Demo? If you want a demo to see if this will work with your own Facebook page, please send me a message via email mike@codeofaninja.com, or via our official Facebook page! Please provide your Facebook page URL on the message, thanks! Today we have learned how to show your Facebook page videos on your website. Did you know that you can also display Facebook Timeline feed on your website? Let us go to the next tutorial: How To Display Facebook Page POSTS on Website? Thanks for visiting our tutorial on how to display Facebook page videos on website using PHP and Facebook Graph API! https://www.codeofaninja.com/wp-content/uploads/2014/10/display-facebook-video-on-website-1-1.jpg 393 750 Mike Dalisay https://www.codeofaninja.com/wp-content/uploads/2019/03/codeofaninja-with-text-3-1030x206.png Mike Dalisay2014-10-22 16:12:112018-07-31 17:54:31How To Display Facebook Page Videos On Website Using PHP? Another solution is to find a web hosting provider that can secure the file_get_contents() PHP function. Your Problem: You need to display custom social media feeds on your website. But YOU DON'T LIKE TO CODE. 2. Fully customize the look and feel of your social media feed instantly. 3. 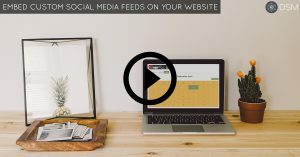 Show contents from your social media accounts to your website automatically and in real-time.